Palin anticipates that America will change for the better under a Trump Presidency. Palin shouted this campaign slogan as she stood with the New York Real Estate Mogul Donald Trump at the Hansen Agriculture Learning Center. 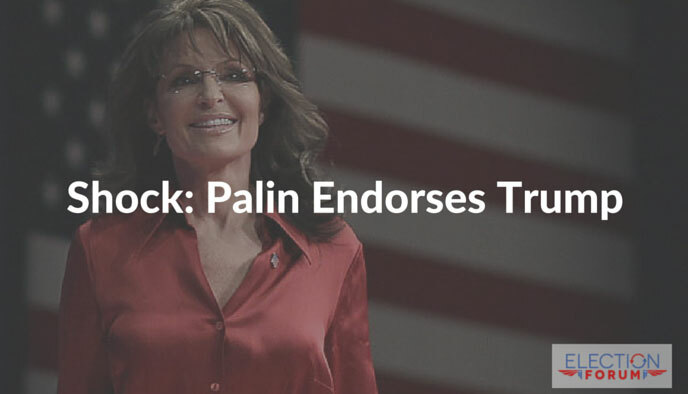 Then Palin gave him her endorsement, long coveted by many conservatives. Like Sara, Donald Trump has weathered the attacks in the press in the US and around the world, yet still stands on his principles. For those conservative Presidential candidates whom she had endorsed in previous races, she exhorted them to stay in the US Senate (a subtle shot at Ted Cruz). She also praised by name US Senator and rival Presidential candidate Rand Paul: “The libertarian streak in him. . .is healthy. [H]e knows you only go to war if you’re determined to win the war”. I was VERY disappointed . But I noticed it was not at all the Sarah Palin we all voted for in 2008 . Her voice was much more shrill …..to the point of irritation . She said all the right things …but the delivery was not her usual BEST . She read the entire speech on and on and on ;I suspect it was NOT her writing …Sarah has such passion for her own beliefs …..she never reads her speeches …she speaks them from her heart ….Seen her in person many many times . Lastly …..you attract the Evangelicals and all Christians by the life you live AND example one sets ……In 2008 she weathered a pregnant unwed daughter BRAVELY …..Now that has doubled to two unwed babies ….Not good for a public figure trying for the Christians vote . And a son reportedly arrested for domestic violence . Then The Donald caps it off by his FAKE biblical knowledge calling 2nd Corinthians …….Two Corinthians …..Guess he doesn’t know how to build a very efficient TEAM after all. Strange endorsement! Cruz no doubt lost some support. I am for Ben Carson so I am hoping Iowa conservatives who were going to vote for Cruz will decide that the good doctor just might be the best “Trump stopper”. Unless there are doubts about Ted Cruz’ Christian faith, which has never been an issue, why is he not more equipped than the good doctor? The “establishment” thing is so misused that it is laughable when opponent used that against him. Ted has stood up to Mitch McConnel, for Pete’s sake. Perhaps God chose Sarah to shepherd Donald, who knows the mind of God, through whom all things are approved? It seems quite unfair that the Palin family’s children are dragged into this conversation and now Sarah’s parenting is judged before us all. Let’s all commit to pray for one another and stay humble before our LORD, then will HE heal this land. Good point. I am disappointed in Palin giving her support to Trump and many other things. And I have been disenchanted about the family given the stream of poor behavior. But, regarding her children, each person makes their own choices about the life they will live. It is not fair to judge the quality of parenting or the quality of the parent by the poor choices of their kids. They are not ALWAYS related. Sometimes really good parents have kids that just choose poorly. Secondly, even if she was a poor parent, people are not perfect and we all make mistakes and learn. Still not sure that this is what I would use to criticize her political decisions. I think Donald has good ideas, says what many people are thinking and bad delivery. He obviously could use a huge dose of humility and tact, however I am willing to overlook that if I think he will not compromise. As for Sarah, I think she is just saying that Trump has the majority of solid ideas to make America safe and great again and she thinks he won’t be bought off. I enjoyed her ABC – comment of “Anyone But Hillary” too. Anyway Trump needs the Lord Jesus … so pray for him! I would consider voting for someone else who would be good and could win, but for example Marco Rubio said during the last debate that he would find Edward Snowden and prosecute him for treason. I think Snowden is a HERO and has sacrificed his freedom to tell the truth about the hacking of ALL Americans’ personal information by the gov. That must stop! I like Ben Carson too but probably wouldn’t vote for him unless he changes his views on forced immunizations. Ted Cruz has some good ideas but I’m not sure if he would stand firm on the things I believe in. No on Bush or Christie! Trump lack character, and character does count. Cruz in fact has been standing firm for what we believe that is why the establishment GOP and senators don’t like him because he won’t cow tail to their political agenda and always stood firm for real conservative beliefs. My husband and I are very disappointed with Sarah’s endorsement of Trump. We don’t believe he is a true conservative. He’s been a Republican for months, not years like Reagan. He’s a narcissist (we already have one in the White House, thank you) and in the not so far past, he was for amnesty, believed that Obamacare should be expanded and there are a few other things that I can’t remember at the moment that were liberal leanings. Ted Cruz is a true conservative and a proven fighter for the citizens of the United States of America.